Internal connections and data transfers are enabled by a fully-meshed layer 2 network consisting of SDN controlled switches. At each distribution site on the Pullman campus a switch with 32 ports of line-rate 10G and 4 ports of line rate 40G is available for researchers to connect into. These connections are routed around the WSU Pullman campus via a fully-meshed, backbone utilizing advanced SDN controlled DWDM optics. This design makes every point on the internal network only one layer 2 hop away from any other point in the network enabling high speed, extremely low latency connections. Three of WSUs large HPC clusters are connected to the HSSRC with minimum 40Gbps connections. The latest HPC, Kamiak, is completely integrated with the HSSRC network. 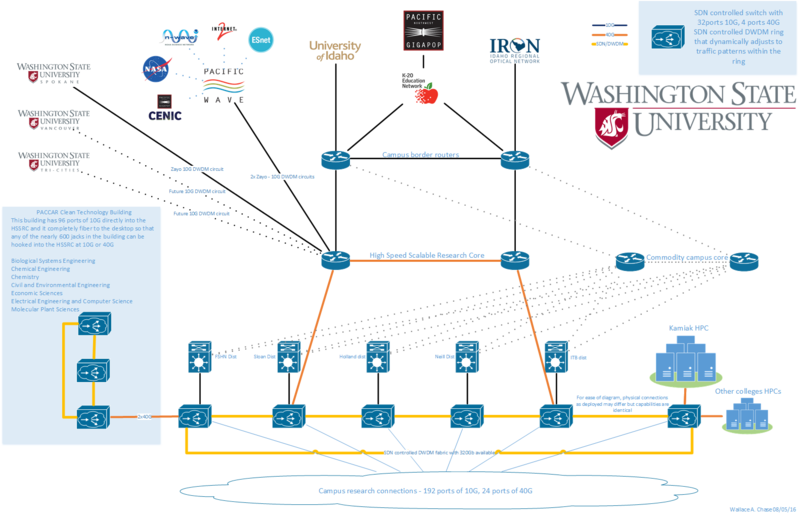 All networks including storage are extended into the HSSRC and can be made available anywhere on the WSU Pullman or WSU Spokane campus. This allows for multiple clusters to share resources and data. The PACCAR Clean Technology building alone has over 90 ports of 10G available for researchers to utilize for access to the HSSRC. A dedicated fiber ring exists in the building with up to 240Gbps of connectivity between any HSSRC connections within the building. The building connects back to the main HSSRC with a 80Gbps connection. Several external connections enabling the flow of data to off are planned for the HSSRC network. WSU ITS has leased 2 10G waves that terminate in the Pacific Northwest Gigapop in Seattle, WA. These 10G waves will be connected to the Pacific Wave International Peering Exchange allowing L2 and L3 connectivity to the following research networks. More information about Pacific Wave International Peering Exchange. Connections from WSU campuses to the HSSRC can be handled in several ways. WSU Spokane has a leased 10G wave that will be used to connect to the HSSRC in Pullman. Other WSU campuses have the options of MPLS circuits across the K20 backbone or as funding becomes available leased waves are a possibility.